The first units of TSXDuino are already being delivered! Thanks to user Pablibiris we will be able to enjoy this hardware soon. What does it consist of? It is a TZXDuino adapted in an MSX cartridge case without external power supply (plug and play). The design comes from Edu Arana and interestingly it was born thanks to a picture from @Errazking, where a TZXDuino was placed in an MSX slot (for convenience). REMOTE connector to control pauses during loading (only in this version from Pablo). It works with version 1.41 of Maxduino! (It allows configuration of motor control, bauds, etc). High compatibility of formats, it loads .TSX/.CAS/.TZX/.CDT/.TAP files. Multisystem! It can be used in other systems just connecting the miniUSB port. It is also planned to design, not in short term, a TSXDuino without data cable that allows the files to be launched through the MSX slot. I appreciate this work very much, I like tapes much. If I understand the description correctly, will a future batch make a cable from the module to the cassette input redundant? At the moment I don't see any advantages except the power supply through the cartridge slot. However, this occupies a valuable slot. Well, I'm looking forward to future improvements. Is there a vague price tag and will it have a shell? More cartridges, in this case I prefer the CASDuino personally, since all you have to do is attach it to the data cable on cassette input and get the .cas files rolling. Since when we did get so many other "extensions" for tapes besides .CAS. 5 diff extensions just for tape input makes it kinda confusing to be honest. It must be mentioned that this is a totally unofficial product and that the TSX file format may be more accurate than CAS but it less flexible. I hope that in the design of this cart they have managed to work out the issues with Class10 SD cards being powered by 5V that many of the clones have. The REMOTE connection is not only available in this version, it is available on the original version here, and several other clones. It is by no means unique and the whole point of the original design was to add this functionality. It should also be mentioned that TZXDuino and CASDuino are open source projects as should the design of this board. MAXDuino is also an unofficial firmware that is not supported by the ArduiTape team. I would also like there to be credit to Andrew Beer for his hard work in the original design and programming. The other extensions are for other machines and are not needed for this cart. The good thing is that you should be able to upload CASDuino firmware to it and have full baud adjustment (Faster than 1200 baudrate using TSX files is highly problematic with TZXDuino). This cartridge is exactly the same as any other clone. The only difference is that it's the only one that you can put directly in the cartridge slot to feed the board and thus avoid a power cable, in addition to the comfort that supposes. In addition it can be used in other systems without it being necessary to use it in the MSX only. You can use the 5 extension files in other systems. The board is tested with speeds until 3850 bauds,with possibility to select 1200,2400,3600 ir 3850 bauds. I have installed Maxduino because for me it is better and more complete and it's supported by the Maxduino team. In first place I have to clearly state that I am not a seller,manager or developer of this product. A MSX version of the TZXDUINO made by @edu_arana and coworked with @jgilcas. Based on the original design of Andrew Beer, Duncan Edwards. This CartridgeDuino / tzxduino version has been made to act as an MSX cartridge but only to take the power +5V and GND from the MSX connector and use it on the board. Also the arduino pro mini has been replaced with a NANO to make easy to upgrade. I have used parts of my TZXDUINO RELOADED design for this. I think that possibly those design faults you mentioned are corrected on this hardware (are different projects). So I think that you should make a full review of real hardware so you can help each others to make a better hardware/software (that is the spirit of an open source project). I am not writing this in order to defend the work of nobody specifically, only I am pointng a potentional origin of confrontation that can harm both projects and future of open source projects for MSX. I have one of this new devices and also a tzxduino . I decided to add this piece of hardware to my collection for avoiding another power suply for the device and this was great for my setup (not so much space and lot of cables, hehehe) and in the other hand the future posibility of the modification for use the slot bus to transmit the .cas and .tsx files directly to the machine. 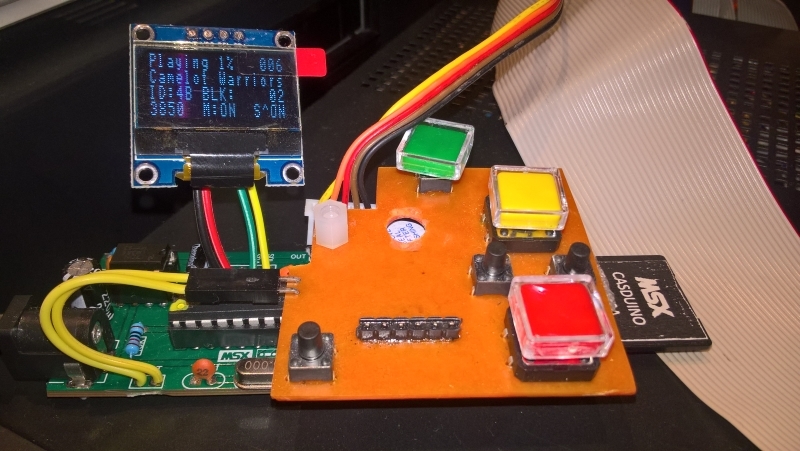 Also TSXduino works with my speccy and my CPC6128 perfectly. Trying loadcax from cartridges like MFR i founded that its a little bit tricky and lot of games failed, so im so happy with this device for loading cassette files. I have tryed this device in all my MSX computers and it works fine in every one of them. In some i have reached the maximum bauds and in others i just reached 2400, but it depends of the sensibility of each model. It must be mentioned that this is a totally unofficial product and that the TSX file format may be more accurate than CAS but it less flexible. Wich is the "official" and wich is the difference between the oficial and the clones of these open source projects? The cartridge is the same as any other clone so therefore it has the same design flaw in that a class 10 SD card will not work properly if the board is being supplied with only 5v of power either via the cartridge slot or the USB port. The firmware has various speeds but not all TSX files will work at the higher speeds. Many will not work about 2400 baudrate. Again the MAXDuino team are an unofficial team and are not supported by the Arduitape team, the original creators of the device. TZXDuino, CASDuino, and ArduiTape were originally designed and built by Andrew Beer and Duncan Edwards. This project is only possible because of their work. 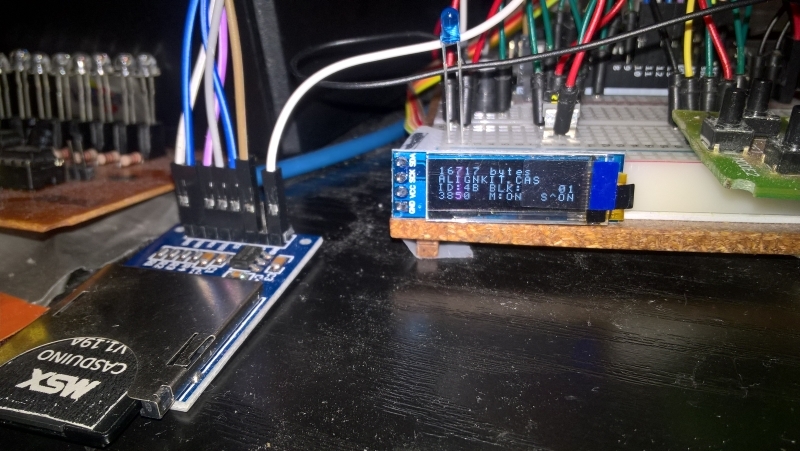 Also mention should be made to Natalia Pujol who added the TSX ID to the TZXDuino firmware. You think but you have not tested. The 4050D should fix the issue but it really needs to be tested. CASDuino and TZXDuino use the same hardware. They are related because without the CASDuino the TZXDuino would never have been built. Without the basics in the CASDuino firmware the TZXDuino firmware would never have been written. The reason that I have pointed out the potential design flaw is so that the cartridge is working properly for customers and also so that I do not have to deal with any issues that arises from those design flaws. Tested here with a 10 class SD and working without problems. Don't worry...you don't have to deal with anyone. This is not your design and you don't builded this boards. Good I'm glad you have fixed the issues. Sadly I know from experience that this is not the case as I still get people asking me about issues with their clone boards and MAXDuino. However, this occupies a valuable slot. I'm glad. I hope it stays that way. @Pablibiris Well, a slot occupied to see, only because of a 5V supply seems to me as already mentioned a waste. I very much welcome the planned extension to a pure cartridge player, which makes tape games much easier to handle for tR owners. But (please don't put my words on the scales) I don't see any reason for your very offensive approach to the writing . Without people like CASDuino, such a project would certainly have been difficult. Please consider this. We use accommodating expressions in our postings as we are all gain the same: A world full of happy MSX users. And tapes. We need more tapes. 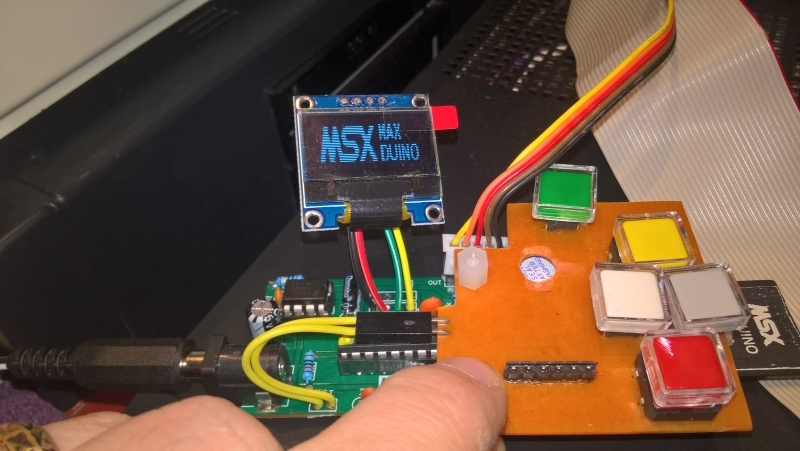 * I publish the news item because I think that is a cool thing, works great and I believe is a very useful device for MSX users around the globe. * A humble user like me points this you it, in order to avoid a negative discussion against casduino and viceversa, and accused me not testing something himself never tested (absurd). Then we forgot TAPDuino, ArdiTape, Caslink or whatever that has the same function? * The manufacturer of TSXDuino predictably answer you peaceably, correcting you like I feared. And the more absurd thing, some users qualify the response as aggresive WTF!!! If, in spite of this post anyone remains aggresive, wants to kill me because he thinks that I hate casduino, tsxduino or any user or thinks I killed their cat or I want to discuss with a negative actitude. I recommend him/her to pet a dog, here you have one, is very therapeutic. Tapuino inspired ArduiTape. It doesn't use the same design and doesn't use any of the firmware it also uses a standard connection rather than the C64 connectors. From Arduitape we developed CASDuino. From CASDuino we developed TZXDuino. TSXDuino is based on the TZXDuino and uses firmware that uses code from both CAS and TZXDuino. The only significant change they've made is to make it powered by the Cartridge slot. The Remote Contol has been an integral part of the design from Arduitape and is not only available on this clone of mine and Andrew Beers work as you state in the original post. When you publish news you should at least make sure that the information you have is correct. I have always stated that the inspiration for the projects were from TAPuino. Again the only similarity in the hardware is the Arduino Nano and the SD card. You did not link to the Github which credited the original authors just said that it was Pablibris and Erdu Arana. It is a common fault that is well known with clones and I asked if the fault had been fixed. I asked if it had been tested with Class 10 SD cards because many clones of the original hardware have a fault where they cannot read Class 10 SD cards if they are powered only by 5v. I was asking a question if the problem had been fixed!!!!!! That doesn't even make any sense. I'm not talking about the size of the sd card I'm talking about the speed of the SD card. It makes no difference on how fast the games are loaded but when many variants of the TZXDuino hardware are powered by 5v they cannot read a Class10 SD card properly. Again you have your facts wrong. Tapuino uses different hardware and firmware. Arduitape uses very similar hardware and has similarities in the firmware but was also designed in part by me. CASlink is something completely different but I'll assume you meant CASDuino, again designed partially by me, uses the same hardware as TZXDuino. Uses firmware that TZXDuino and MAXDuino are based upon. What is aggressive about "Good I'm glad you have fixed the issues." and "Sadly I know from experience that this is not the case as I still get people asking me about issues with their clone boards and MAXDuino."? If you had gotten you facts straight in the original post there wouldn't be any "negative actitude". Remote Control is available on ArduiTape, CASDuino, and the original TZXDuino and not just on this board. The TSX Baudrate options do not work with all TSX files. Some fail at 2400 baudrate, most fail at 3600 baudrate, and non (in my experience) work at 3850 baudrate. I am glad that they have fixed the issues with Class10 SD cards. It's a concern taken off my mind. By the way, that dog picture was intentionally meant to offend and you know it. So not only do you seem incapable of getting your facts right but you are insincere too. Thanks for reading, and keep in mind ALWAYS I don´t have anything personal against anyone here, and i am grateful about any MSX project, I am against certain ATTITUDES not against persons. Mod: I beg you please to stop this confrontation. If you won't get back to facts, I will close this thread temporary. Thank you guys! An actual datrecorder is external and not in cartridge format which just wastes another slot, something that the casduino actually delivers: external hardware connected to the ports it's intended to be. Making it a cartridge version for just avoiding a simple 5v cable or powering it by usb whatsoever and wasting another slot because of this reason, doesn't get me interested at all. Conecting it to a MSX slot it is not a must. It's an option. As descrived in the first post you can also power it via microUSB port. So you can use it inserted in the slot, or as usual, powering it externally. It's upgradable over USB. Nothing mentioned as external use: " It is a TZXDuino adapted in an MSX cartridge case without external power supply (plug and play)"
"It can be used in other systems just connecting the miniUSB port." The same for the MSX. You can use It just using the USB like power supply. And you said that with this cartridge you waste a cartridge slot...I repeat: you want to use V9990 or OPL4 to play tape games? Just read my previous comments an you will see I allready use the best device: CASDuino. Average load per game, fe After Burner: 3 minutes. It would be very great to have a such a device for tR's or Casio's which don't have a DIN Tape connector. So I'm really looking forward to an upgrade that transfer the datas internaly. That's simply a half baked line, could have been much more specific, since this is yet no guarantee it is actually a fact, since some random people are saying it is, but no one can actually confirm this. Hey, why won't we create a datacassette game with OPL4 and Music Module music? Good job Pablibiris, wonderful device! Is this hardware available? Can't find where to order and how much will it cost? Good news after research and modification, adaptation of the source code for my PCB I inform you that the new code based on CODE MAXDUINO 1.41M2 is operational !! ie we can now read .CAS or .TSX files with the same PCB and the same ATMEGA 328.
the tests are conclusive ..